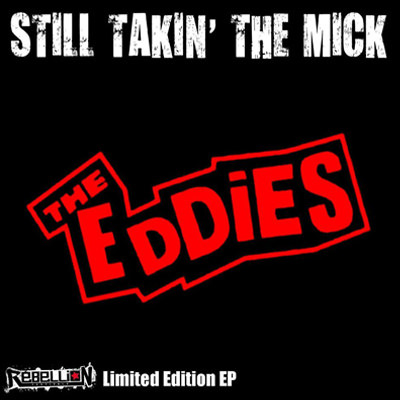 The Eddies well and truly are a band at the heart of the Tayside punk scene. From continuously championing the genre in Dundee through their own music, to members’ involvement in the much loved, yearly Punktoberfest event, they have always been live in the community. Their upcoming EP Still Takin’ The Mick is an excellent example of this life-long love affair. Billed for release at their Rebellion appearance at the start of August, it is an (all too brief) upgraded version of previous efforts. In some ways, it leans a little harder on some of their ‘cleaner’ influences than the likes of Punk For Life, but still retains the energy for which they are known. A musical “lacing up the Cons/DMs”, if you like. And it brushes up very well indeed. Limited to 100 physical copies for the first run, this is likely to be a memorable release for those who get in from the start. Punchy, full-throttle riffs, and acerbic vocals are delivered with top grade production (mixed by the band). The upbeat mood also hints at a tastefully mature humour, as a counterpoint to the rock n roll attack. Rife with ‘whoaa-ohhs’ and instant choruses, it’s a challenge not to sing along from first blast. Very sadly, The Eddies’ guitarist, Mick Kilbride, passed away early 2017, ripping a hole in the heart of the local scene, but he did leave his name behind in the title of this release. Although some of these tracks seem to have been around since then (having been debuted at Rebellion last year), the band themselves say “It’s taken this long to get to a finished product we were happy with, and proud to dedicate to his memory.” A huge amount of heart and thought has clearly gone into the making of this record, and it really shows. Posted in Latest News, Reviews and tagged Punk, Reviews, Slow Dragon Music, The Eddies.